This excuse works for everything, try it! I find the “rationale” in the cartoon to be completely at odds with everything I’ve ever been taught about Christian theology: supposedly their God gave them complete freedom of choice in their behaviors !!!! This is a very bad caricature of what Christians, for example, believe Some people may try on that kind of reasoning, at least with some things, but it really doesn’t wash. The view that God has perfect foreknowledge, including foreknowledge of what people will do (even before they were born) may not be universal among Christians, but it’s certainly not uncommon. And it is supported by biblical text, for example: “”Before I formed you in the womb I knew you, And before you were born I consecrated you; I have appointed you a prophet to the nations.” (Jeremiah 1:5) The implication drawn out in the third panel is a bit silly, but that’s obviously the point….it’s a cartoon. Job 42 says NO PLAN of God can be thwarted, which means every murder, plague, sin, etc. is God’s plan! If you deny this you deny Job 42! Here I do not mean to say that there is really a god. What I mean to say is that here the procedure adopted by the scientists is not full-proof. It may be the case that there is really no god. In that case if the scientists adopt some other means instead of assuming that the vacuum is a real vacuum, then also they will be able to show that actually no god is required for explaining the origin of our present universe. But in this case we can be absolutely certain that there is no god. 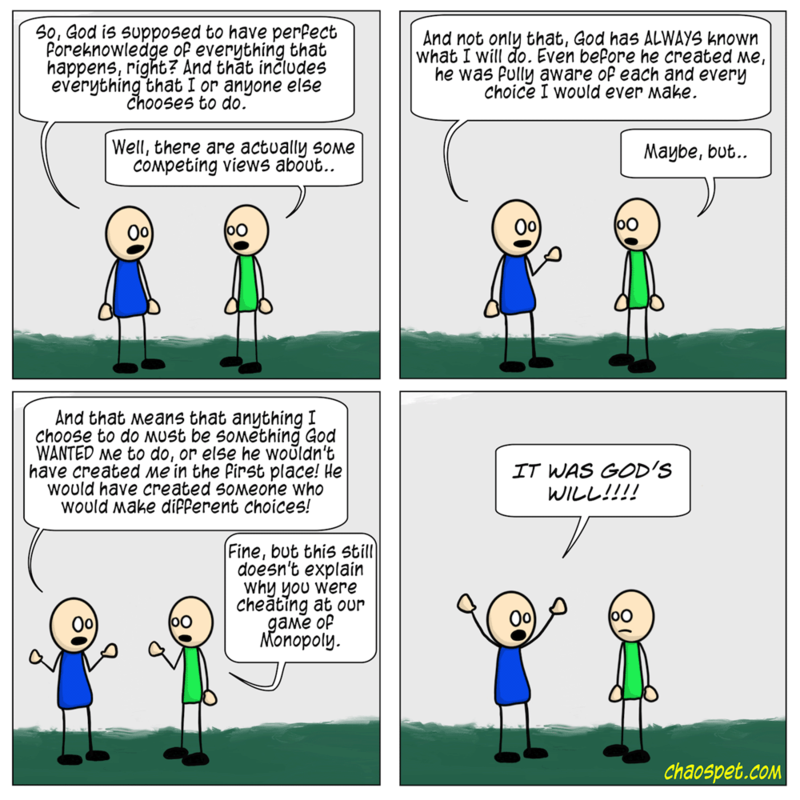 The present procedure fails to give us this absolute certainty about the non-existence of god.